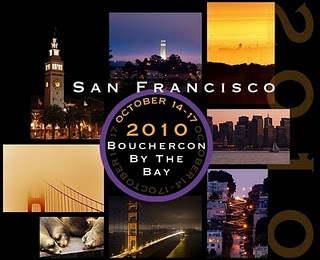 Like many who couldn't attend the fantastic Bouchercon festival in San Francisco last weekend, I have been following along various great blogs and reports from people who were there - the likes of Ruth and Jon Jordan of Crimespree magazine, J. Kingston Pierce of The Rap Sheet, Peter Rozovsky of Detectives Beyond Borders, and Janet Rudolph of Mystery Readers International. It looks like it was a terrific few days, filled with lots of great events. One event that was highlighted by Ruth Jordan on the Crimespree blog yesterday particularly made me groan (that I'd missed it) - Gregg Hurwitz interviewing Michael Connelly. That would have been very cool. Both are terrific writers who set their novels in Los Angeles, and their conversation would have been something to see. As Jordan said on her blog, "Last weekend in an overcrowded room fans of both Special Guest Michael Connelly and Hurwitz himself got to watch a young man talk to one of his hero's. They spoke of character, crimes and setting. Two animated men speaking with passion about that they love most, the construction of the best in fiction set in a City full of both promise and dread. L.A. is a very special town. With more facets than the world's brightest diamonds there are no limitations to what the writer can find within the county limits. Both Connelly and Hurwitz continue to find something new and brighter with each outing." I am fortunate enough to have interviewed both Hurwitz and Connelly in the past year and a bit. Hurwitz was here in New Zealand late last year, touring in support of OR SHE DIES (the UK/Aust/NZ title for THEY'RE WATCHING - for some reason it was released here a year before it was in the USA), and I met him at an event in Auckland, and had lunch with him and his publicist. He's a terrific guy, and a very good thriller writer. You can read my later 9mm interview with him here as well. Of course I also recently interviewed Michael Connelly about his latest novel THE REVERSAL too, for an article in the Weekend Herald (read here). Two terrific guys - intelligent, interesting, and generous with their time. Top notch crime writers too.